This year’s Green Heart Community Awards, backed by the News & Crier and organised by Huntingdonshire District Council, took place at the Burgess Hall in St Ives. Judges received more than 30 entries for six categories including: Best Primary School, Best Secondary School/College, Green Champion of the Year, Best Wildlife or Nature Initiative, Best Environmental Project and Best Business Environmental Project. The shortlisted nominees for each of the categories were invited to an evening dedicated to them and their hard work in helping to improve the environment of Huntingdonshire. Great Gidding Parish Council nominated Michael Trolove for the Green Heart Community award and he came runner up at the awards ceremony held at the Burgess Hall on Saturday 15th June. Working with the Parish Council and the wildlife Trust, Michael Trolove has always been a valuable asset to the wildlife of Great Gidding. In the last year Michael has dedicated a great deal of time to the renovation of two village ponds and installed a dipping platform. He has recently prepared a third pond in the Jubilee Wood and as a trained Newt Officer, Michael has also developed the Great Gidding Newt Trail; popular with villagers and visitors alike. As a Tree Warden, Michael keeps a full list of trees on site and all of them have been given a numbered tag for identification. He has been in discussions with DEFRA concerning Ash Dieback Disease and spends much time planting trees around the Parish, organising a planting event and pop up coffee shop, enjoyed by all for the Diamond Jubilee. Michael works hard on the maintenance of Jubilee Wood, monitoring, weeding, planting new trees and mulching and in the last year added some old varieties of fruit tree to the planting scheme, created log piles and built bug boxes to further encourage wildlife to the area. 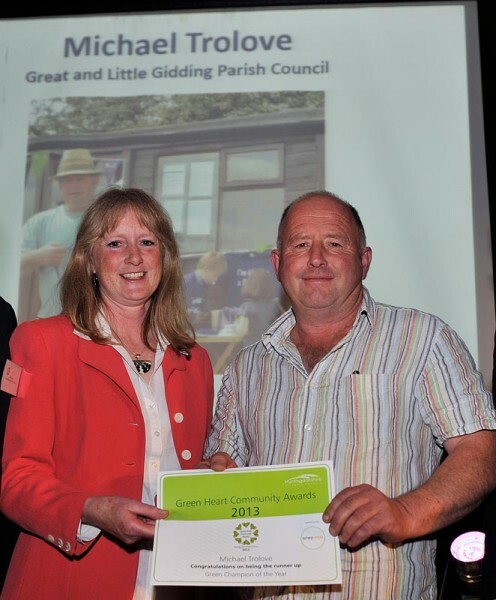 Michael Trolove is instrumental in co-ordinating the upkeep of the Jubilee Woods, ponds in the area and all the trees in the Parish and demonstrates log-term commitment to protecting and improving open space within the village of Great Gidding. Well done Michael. Very well deserved. What a nice man !